I think by now you all know how much we love babywearing here. This is a lovely little book for toddlers.As Backpack Baby and his dad walk around their village, Baby shares secrets with the people they meet. We don't know what the secret is until the end: Backpack baby has a new baby who is in a carrier on the front of Daddy! I love that the baby is carried by his daddy and the children get delighted to see babies in books carried just like themselves. Aw lovely - where do you find your books? Online or is there a special shop near you that happens to sell these amazing finds? Ah what a gorgeous theme for a story! My two would love to see those pictures too. Thanks for the recommendation! Linked up! Hope to see it. Maria, I wish there was such a shop but no,I find them online from forums, blogs etc. and then buy them online generally. What a darling book and I love the cover art. That book looks lovely. 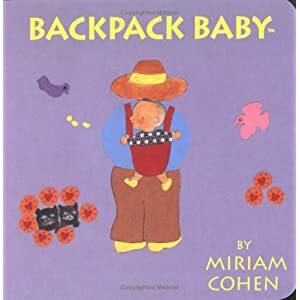 I will recommend it to a friend who loves baby wearing. I tried with the twins but it was too hard on my back! Usually, when a good book is recommended, I look it up in our library system and rent them. If we fall in love with the story, we buy a copy. I searched our local libraries and can't find the Backpack series. : ( I think we'll have to skip to buying. There's fairly inexpensive from what I've seen, and we wear our babies still at 2 1/2 and 4. They'd love the stories. Thanks for sharing. That looks such a lovely book, and the cover is such a beautiful picture, my girls would love it too, thanks for sharing.